Located at the new United States Tornillo-Guadalupe U.S. Port of Entry, “Firmamento” is a landmark gateway structure to the entrance of this new complex. 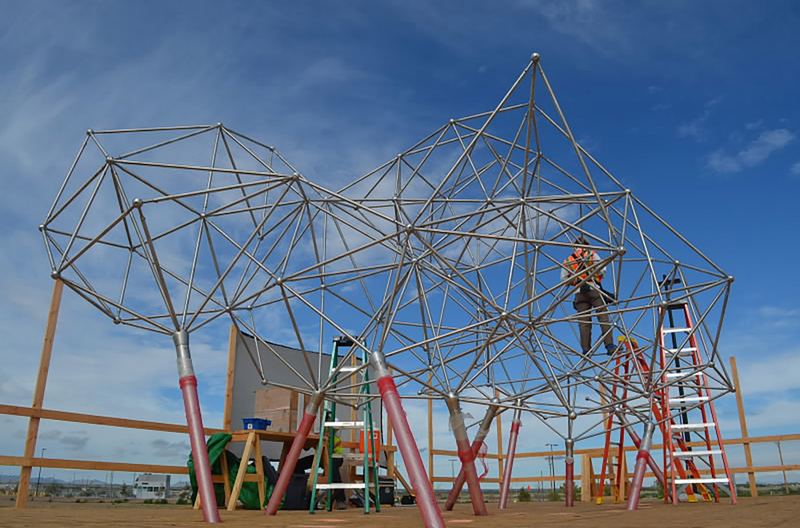 The three-dimensional space frame structure is constructed from custom milled stainless steel blocks and standard pipe sections. The merging of art and science, a synthesis of organic and man-made structural principles derived from organic forms directed the initial geometry. 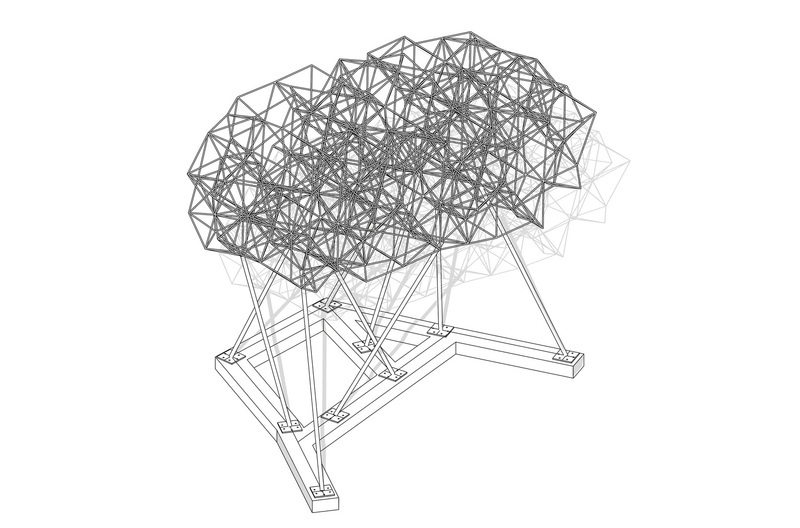 The base module, a tetrahedron is utilized to create the structural system. Specific parameters including structural performance, 5-axis machining techniques, proportional analysis and cost estimating defined the initial limits of the 3D model design process. The evaluation of the output informed the proceeding iterations and began to develop a controlled transformation of the symptomatic form. The variation of the central node detail developed the main repeating model of the structure. A rigorous evaluation of the packing system was analyzed to develop the final cluster. The assembly consists of 29 unique nodes and a total of 14 unique pipe lengths. There is a total of 230 standard nodes and 912 pipes that produce the final form. The composition allows for the camouflaging of the system, only revealing itself when viewed from a particular angle. A balance of module size, pipe size and system complexity had to be achieved to develop the resulting effect. The ultimate goal was to have the structure take on a new character and read as a cohesive and interconnected mass.